You’ve got to hand it to RØDE, an Australian company that finds tasks too difficult for many non-engineers and then solves them with a simple a solution. They have done just that with the new RØDECaster Pro, a device some are calling a “game-changer” for podcasters. But its features can be useful in many broadcast applications, especially news. The RØDECaster Pro ($599) from RØDE is the first fully integrated podcast production studio. It combines a feature set never before in a podcasting device and does each very function well. It is also remarkably easy to use. 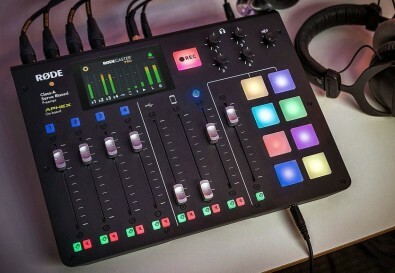 The 4.3 pound device combines four Class A microphone channels with phantom power; built-in microSD recording; eight programmable sound effects pads; and one of the most impressive new features: a phone connection via Bluetooth or TRRS cable that automatically provides mix-minus audio. This allows balanced two-way conversations between the host and caller by simply hitting a single button. No echo is heard by the caller. Telephone interviews with a remote guest never sounded so good. (This is very useful for news reporters who wish to record a phone interview.) No one before has ever made mix-minus recording so simple. The RØDECaster Pro has top-notch preamps, which provide a much cleaner gain structure with lower levels of distortion. The preamps are also servo-biased, keeping distortion levels low. The result is an incredibly clean signal. The adjustable mic signal can also be enhanced with the built-in audio processors, Aphex Aural Exciter and Big Bottom. Aphex was acquired by Rode in 2015. These classic processors have been incorporated into the RØDECaster Pro. The device also features multistage dynamics, such as compression, limiting, de-essing and noise-gating. This processing can dramatically enhance the quality of the human voice. The eight programmable sound effects pads allows for instant triggering of interview segments, sound effects, music, jingles, applause and ads. Users can record audio direct to the programmable pads from any input, or drag and drop files from a computer using the supplied software. The color of the various buttons can be changed. The device operates as a standalone unit straight out of the box, recording direct to a microSD card. It can connect to a computer via USB. (It is also a USB audio interface). This means programming can be recorded directly to favored software. Two pieces of software are downloadable — one for firmware updates and the other for programming the buttons. Use the firmware app and it will determine if the latest version is installed. If not, it will update firmware with one button. No more downloads and moving the software to SD cards. The RØDECaster Pro has four headphone outputs with individual volume controls and an output for stereo speakers with separate volume control. It works at 24-bits/48 kHz. In addition to the microSD card slot, it has 512MB of internal memory for storing sounds on the programmable pads. My only small gripe with the device is the lack of an included instruction manual. RØDE provides a online suite of instructional videos and large cards with very rudimentary instructions. However, while digging down into the menus is simple enough, a good, written instruction manual would be desirable by many users. When podcasting debuted at NAB 23 years ago, no one realized how vast it’s popularity would become. It was also impossible to predict that an entire audio broadcast station could be reduced to a laptop-sized console. But it happened. This device is one piece of brilliant engineering that’s not only a game changer for podcasters, but a serious tool for anyone reporting and recording television interviews. I predict it will find a permanent home in both broadcast and podcast studios.